Anyone involved with online marketing will know how quickly the industry evolves and my take on 2016 is the rate of change is only going to pick up. It’s a complex and highly volatile industry, however if you’re prepared to accept change and keep up with the modern trends, then it’s an exciting era to be involved with. The key to getting ahead in an industry that’s hard to break through all the noise is to adapt early to any shift in trends, and doing so might just get you that little bit of an advantage over everyone else. Apps Showing Up In Google’s Organic Search Results – It’s quite possible to see already apps being indexed on SERPS where users are asking a product query of some sort. Example being, a search for ‘best to do list’ returns a listing for Wunderlist on Apples ITunes App Store. Once business owners adapt to apps and more Google users appreciate the return of apps in the SERP’s then it’s only a matter of time before apps begin to replace websites. Video Advertising – Facebook and other social media platforms already allow users to utilise video for ads, but according to Forbes, video ads are coming to Google. Users are becoming more receptive to video ads, and businesses that already use YouTube for advertising will have a leg up on everyone else since Google maintains ownership of YouTube. Mobile Searches Will Dominate –In 2015 Google announced mobile search had overtaken its desktop counterpart, and that trend will only continue as our dependency on mobile devices continues to grow. Business owners were a little complacent with mobile and getting their websites mobile friendly, though Google got everyone moving quite quickly with the release of mobilegeddon. The algorithm that detects mobile friendly websites and punishes those that aren’t. Social Media Content Will Influence Search Results – Posts on Facebook , Twitter and even LinkedIn will prove to have more importance and influence the search results. At present approx. 76% of online marketers use social media to support their content distribution and help boost SEO efforts. General Google users will see Facebook, Twitter etc. as trusted sources of information, so it’s vital every digital marketer does everything possible to rank social media properties in the SERP’s. Voice Search Functions – Platforms like Siri, Google Now and Cortana owned by Apple, Google and Microsoft respectively will start to become popular amongst users as mobile activity continues to increase, providing more efficient and safer searches. Research suggests though voice searches are likely to be more specific and long tail rather than conventional keywords. Content Curation Will Get Bigger & Better – According to Digitalcurrent.com, Knowledge Graph, wiki, local, maps, social media, news, images and videos make for85% of Google search results. These statistics are indicating that people are now looking for sources that return all relevant information for a specific subject or topic rather than selecting the one place. Business owners can build authority and trust within their market by collecting and crating content from other high authoritative sources and re-purpose that content to display it in one place for their users to see. 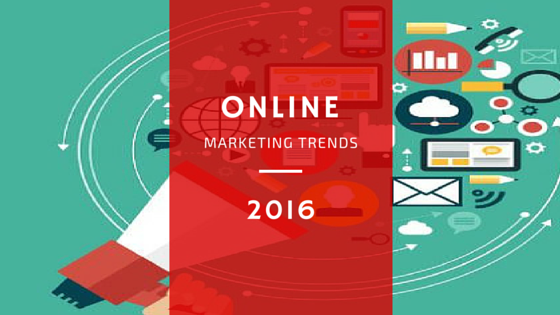 Though online marketing trends keep on changing, I expect that these 6 online marketing trends are most likely to dominate the scene in 2016. Nevertheless, I’m sure by embracing these trends, and keeping an eye out more any I’ve missed, you’ll be able to spearhead the market in 2016.